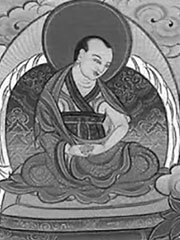 Longchenpa or Longchen Rabjampa (1308 — 1364 possibly 1369) was a major teacher in the Nyingma school of Tibetan Buddhism. Along with Sakya Pandita and Je Tsongkhapa, he is commonly recognized as one of the three main manifestations of Manjushri to have taught in Central Tibet. His major work is the Seven Treasures, which encapsulates the previous 600 years of Buddhist thought in Tibet. Longchenpa was a critical link in the transmission of the Dzogchen teachings. He was abbot of Samye, one of Tibet’s most important monasteries, but spent most of his life travelling or in retreat. Apart from Longchenpa’s names given below, he is sometimes referred to by the honorary title «Second Buddha» (Tib. rgyal ba gnyis), a term usually preserved for Guru Padmasambhava and indicative of the high regard in which he and his teachings are held. Like the Third Karmapa Rangjung Dorje, he carried the title «Kunkhyen» (All-Knowing). A reincarnation of Pema Ledrel Tsal, as such Longchenpa is regarded as an indirect incarnation of the princess Pema Sal. He was born to master Tenpasung, an adept at both the sciences and the practice of mantra, and Dromza Sonamgyen, who was descended from the family of Dromton Gyelwie Jungne. Longchenpa was first ordained at the age of 11 and studied extensively with the Third Karmapa, Rangjung Dorje. He received not only the Nyingma transmissions as passed down in his family, but also studied with many of the great teachers of his day without regard to sect. He thus received the combined Kadam and Sakya teachings of the Sutrayana through his main Sakya teacher, Palden Lama Dampa Sonam Gyaltsen, in addition to the corpus of both old and new translation tantras. At the age of 19, Longchenpa entered the famous shedra (monastic college) Sangpu Neutok, where he acquired great scholarly wisdom. He later chose to practise in the solitude of the mountains, after becoming disgusted by the unpleasant behavior of certain scholars. When he was in his late twenties two events occurred that were to be of decisive importance in his intellectual and spiritual development. One was a vision of Guru Padmasambhava and his consort Yeshe Tsogyal, and the other was his meeting with the great mystic Rigdzin Kumaradza (alt. Kumaraja). It was in the mountains that he met Rigdzin Kumaradza, who was traveling from valley to valley with his students under the most difficult of circumstances. Together with Rangjung Dorje, Longchenpa accompanied them for 2 years, during which time he received all of Rigdzin Kumaradza’s transmissions. Through the efforts of these three, the diverse streams of the «Innermost Essence» (nying thig) teachings of Dzogchen were brought together and codified into one of the common grounds between the Nyingma and Karma Kagyud traditions. After several years in retreat, Lonchenpa attracted more and more students, even though he had spend nearly all of his life in mountain caves. During a stay in Bhutan (Tib., Mon), Longchenpa fathered a daughter and a son, of which the latter, Trugpa Odzer (b. 1356), also became a holder of the Nyingtig lineage. A detailed account of the life and teachings of Longchenpa is found in Buddha Mind by Tulku Thondup Rinpoche. He was reincarnated as Pema Lingpa the famous terton (finder of sacred texts). Longchenpa is widely considered the single most important writer on the Dzogchen teachings. He is credited with more than 250 works, both as author and compiler, among which are the famous Seven Treasures (mdzod bdun), the Trilogy of Natural Freedom (rang grol skor gsum), the Trilogy of Natural Ease (ngal gso skor gsum), and his compilation — plus commentaries — of the Nyingtig Yabshi. He is also a commentator of the Kunje Gyalpo Tantra (Tib., kun byed rgyal po’i rgyud; «The King Who Creates Everything»), a text belonging to the Mind Class (Tib., sems sde) of the Ati Yoga Inner Tantras. Lonchenpa combined the teachings of the Vima Nyingtig lineage with those of the Khandro Nyingtig, thus preparing the ground for the fully unified system of teachings that became known as the Longchen Nyingtig (by Jigme Lingpa).